Say goodnight to tired-looking skin with this cellular-energising face oil. This easily absorbed, pure unadulterated nectar works in harmony with the skins natural repair system to intensely hydrate, nourish and rebalance skin, whilst stimulating cell regeneration to reduce the appearance of skin ageing. A complex blend of 18 nutritionally-tailored phytoestrogen-rich and naturally derived oils, vitamins and plant extracts. Includes rare argan, sea buckthorn, and hibiscus flower, together with proven phytoestrogens soybean, evening primrose and flaxseed. Indulge in the evocative aroma of spa serenity as you drift off into a deep restorative sleep. 100% natural plant based oils. Argan oil, sea buckthorn, hibiscus flower, camellia, evening primrose, soyabean, rosehip, grape seed. Warm a few drops of this luxurious elixir in the palms of your hands to activate the ingredients and then massage onto cleansed face neck and décolletage each evening. Use an upward and outward motion and feel the nutrient-rich phytoestrogen oils de-stress both the skin and mind, bringing a naturally beautiful, refreshed and radiant complexion by sunrise. – For an intense and deeply moisturising treatment add a few drops of the oil to Pause Hydra Crème in the morning or evening, or add to bath water for a truly luxurious and hydrating spa experience. Can also be used to treat acute dry areas such as elbows or heals for instant relief. 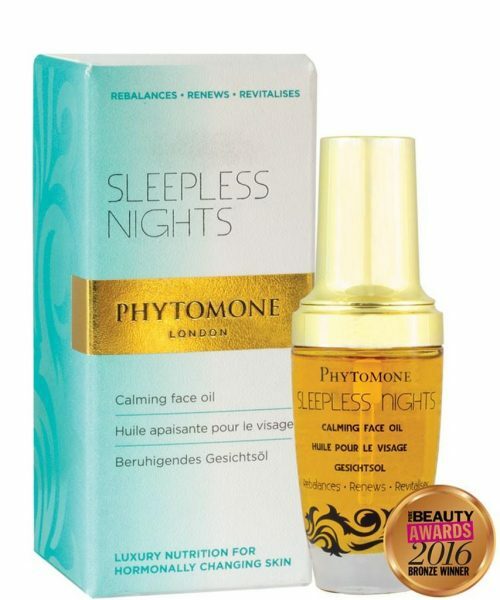 ITV Tests our Sleepless Nights Calming face Oil, watch to find out their verdict.